Go to original pattern for design DROPS 108-55. 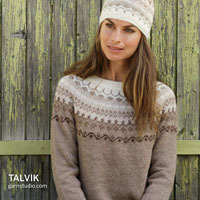 Knitted DROPS shoulder piece with cables, tied at the front in ”Alpaca” and ”Vivaldi”. 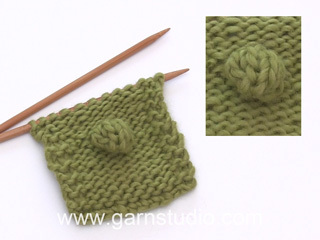 DROPS pointed needles size 5 mm – or size needed to get 17 sts x 22 rows in stocking st with 1 thread of each quality = 10 x 10 cm. 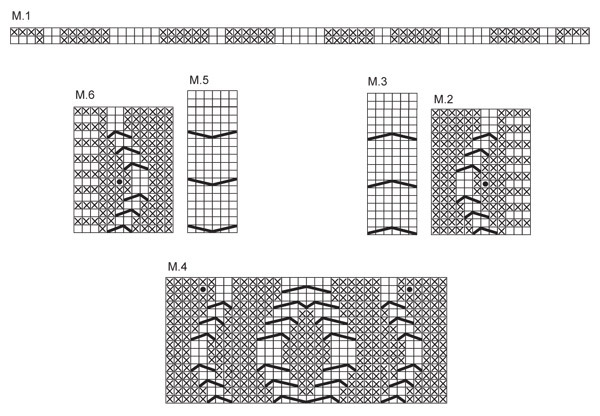 Pattern: See diagram M.1 to M.5. Diagram shows the pattern from the RS. = bobble: K1, 1 YO, K1, 1 YO, K1 in the same st (= 5 sts). Work 4 rows stocking st on these 5 sts. Now lift 2nd st over 1st st , 3rd st over 1st st, 4th st over 1st st and 5th st over 1st st = 1 st left. Bonjour Tchone, le diagramme en ligne est déjà à jour, cette information concerne la version papier du modèle (catalogue). Bon tricot ! Please ask your shop for help. 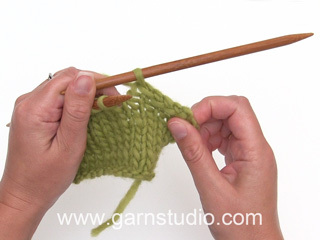 If you bought original Garnstudio yarn you will get great help at the shop. I am not understanding the dots in the M2, M4 and M6 patterns. 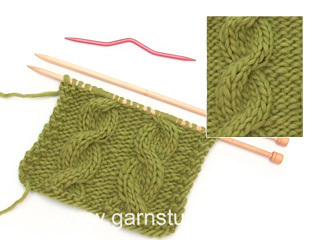 Am I supposed to knit/purl the dotted stitch? Am I then supposed to lift the stitches as indicated and then slip them off the needle (so a form of decrease going from 5 to 1 stitch?)? If it is a decrease, where is the equivalent increase? Or is this meant to be some type of bobble? Thank you. 1st row in pattern is explained seen from RS. Next row when knitted from WS: 3 garter sts – see above - * P3, K1 *, repeat from *-* a total of 3 times until 6 sts remain, P3, 3 garter sts. Continue established pattern with 3 sts in garter each side. 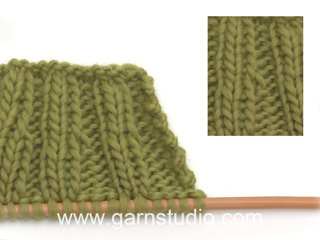 In the very beginning of the pattern, it talks about garter and knit stitches separately. What is the difference between them? Thank you. Absolut beautiful. Håller på att sticka den - men akta er, höll ögonen öppna det blir lätt missräkningar!